Before you decide whether that manuscript is publishable. Before you scour the interwebs trying to decide how to publish, indie or otherwise. It doesn’t matter how fast you climb if you’re tackling the wrong hill. A Mission Statement is your compass, pointing you toward the true-north of your core values. A Five Year Plan is the map of the terrain you have to cross to get there. The next section, Taking the Road Less Traveled, talks about ginning up the courage to take the trek. I wrote my first Writer’s Mission Statement in 2010, before I had any glimmer that publishing would be in my near future. I’ve updated it every year – this year has more changes than most. I’ve expanded beyond “young readers” into adult lit. I’ve explored the short form. And I’ve added a section that reflects my deeper understanding of my creative need in storytelling. To leverage my background in science, engineering, politics and life, to create compelling stories and characters that pose moral questions to young readers and make them think. To have every story be an improvement in craft. To be a leader and member of a supportive writing community, through blogs, critiques, and social networking. To create a body of novel length works that reaches a large number of young readers, to provide the greatest impact on young lives. and leverages innovations in technology and storytelling to explore the reaches of my creativity. *A good mission statement won’t change tremendously year-to-year, because it is a reflection of your core values. 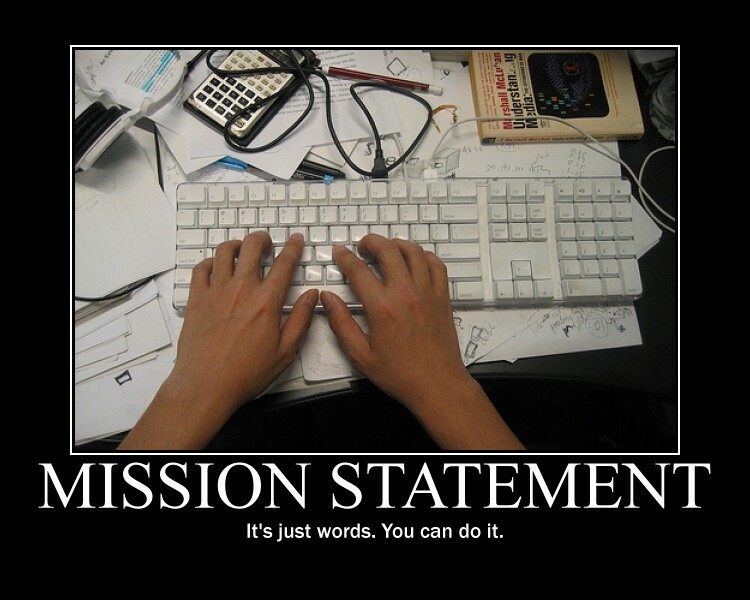 Writing a Mission Statement may seem like a waste of time. Life is hectic, the kids need to be fed, the laundry has to be done, and you need to be efficient with your time! Before you dive into your Five Year Plan, give some thought to the type of writerly life you want. Having a career that reflects your core values: this is the key to happiness, my friends. And I would argue that it’s the key to success in your career as well. Identify your core values first. Then, when you make more concrete goals and an action plan to get there, you won’t spend five years climbing a hill only to find – once you crest the top – that your happiness lies on another hill altogether. To leverage my background in science, engineering, politics and life, to create compelling stories and characters that pose moral questions to readers and make them think. This statement is a great distillation of why I wrote Open Minds, as well as pretty much every novel I’ve written – I love to make my readers think. Whether they’re children’s stories or adult, steampunk, science fiction, future-noir, or romance, I like to weave in mind-bending questions that make my readers think, What would I do if that story were real? A girl in a telepathic world who has to mind-control everyone she loves to fit in. A man who collects life-energy debts in a cruel world that decides who is worthy of living and dying. A boy and a runaway faery battle to remain on earth – but there’s only one body for their two souls. A girl pretends to marry for love in order to stop a war. A boy who wants to be a machine because they’re better – at everything – than humans. It took me some time, when I first started writing, to fully embrace my geeky tech side in my writing. To acknowledge that I wasn’t just there to entertain but to engage reader’s brains. When I did embrace that idea, that is when my writing really came together. I think we always function better – as human beings – when the many facets of ourselves are integrated. I suspect you have a deep reason why you write. Think about it. Explore it. Use words to articulate it. Then put it down into a tidy sentence that you can use as a lighthouse for the days when you forget. This really strikes home as I continue to write new stories, starting over in new worlds. The blank page is intimidating in the best of times, but when you have some success in the bag, it becomes more so. Because you have to be better than the last book. My greatest fear is the stagnation that I see some writers experience. I’m early in my career, but it can happen. I think the danger is especially great for indie authors, because the temptation is to write fast, produce large volumes of work, but not push further in improving the quality of those works. But this is precisely backwards. Quality does matter for sales (especially quality in storytelling). My attempts to improve my craft this year included a creativity workshop, stretching myself by writing a serial, attending a nine-month workshop on writing a screenplay, as well as a four-day writing intensive workshop led by bestselling authors. Every writer approaches this differently. But the core competency of your writing craft should rank somewhere on your Mission Statement. To create a body of works that reaches a large number of readers and leverages innovations in technology and storytelling to explore the reaches of my creativity. I’ve always written “fast” – meaning that I spent ridiculous numbers of hours every day writing. In the five years I’ve been writing fiction, I guesstimate I’ve written nearly a million words (finished works, or nearly so). That doesn’t include my blog (which was the source material for this book). This fevered pace was because I believed firmly what Ira Glass says in his inspirational video: that you must produce a large body of work in order to reach your potential as a writer. Ira Glass: Do a huge volume of work. This part of my mission statement is really two, somewhat contradictory, parts: 1) write stuff and get it out there (i.e. publish) so that readers can read it, and 2) don’t just publish any old thing, be creative. This tension between the two poles – publish fast vs. publish well – is one that’s felt keenly in the indie publishing world. There is enormous pressure on indie writers to produce work quickly – a striking difference with the trad-pub world, where releases are spaced out and writers are sometimes barred from even submitting their work too quickly. When you’re an indie author, you have to find that balance yourself (rather than have it externally imposed). Early on, before I was published, I just wanted to “reach a large number of readers.” And that’s still my goal (and always will be). But now I see the value of writing something even if it won’t (likely) be a runaway hit (my middle grade Faery Swap). I see the need to write the story that’s in your heart even if it’s not in the schedule (Debt Collector). And I see the value of looking long-term at building a “body of works” that include a range of stories, not just the ones that may (or may not) sell. Creativity is your most valuable asset in this business: it has to be nurtured and grown, even if time spent doing that doesn’t always reflect in an immediate sale. (I also believe that it will be reflected in sales, eventually.) At the same time, I see the value of having works out there, selling, growing a fanbase for me, and providing income so that I can justify all those ridiculous hours that I spend at the keyboard. This part of the mission statement reflects my values on the importance of both writing and publish fast and writing and publishing well. Those aren’t always in tension, but when they are, I believe each needs to be given its due. I encourage you to spend time thinking about this part – it will be instrumental in guiding your future decision-making. To be a leader and member of a supportive writing community, through blogs, critiques, and social networking. This part has been a constant throughout the last five years of my writing life, but the form of it has morphed over time. In the beginning, it was forming a writing group, going to conferences, exchanging weekly critiques, starting a blog. Then it became full-manuscript critiques, deeper friendships with writers, broader social reach with readers through publishing. Then it became leadership in this indie community, membership in indie author groups like the Indelibles and Emblazon, creating publishing teams of cover artists and editors, and remembering to have fun along the way. And figuring out how to not let social media eat away at my productivity while still keeping a finger on the pulse of the quickly changing publishing world. For some writers, your Mission Statement may read: “avoid social media at all costs.” And there are authors who are successful without it. But for me, being part of the writing community was integral at every step of my development as a writer: in finding critique partners, in understanding the market, in knowing when to leap into indie publishing. I wouldn’t be where I am without my connection to that community. And this book is part of feeding my experience back into that community, to help my fellow writers on their journey. I do this because it’s part of my core values, but I’ve seen the manifold benefits of it over the years in everything from support to opportunities to sales as well. « Grim Reaper or Dying Universe? I'm really looking forward to those last three premises. I've never done this on paper, though I have thought it through in my mind. Actually writing it down will make it even more solid in my life. Great words of wisdom. My first mission statement, although I never expressed it as such, was to "write a story about kids my daughter's age for her to read." As I wrote, and actually the daughter of a friend of mine read it and loved it, my mission changed. It has continued to change over the past four years. I know people in business who write a mission statement and treat it like the tablets coming down from the mountain. Stone. Immutable. But, as you point out, they should be ever evolving things that we examine regularly to see if they still fit what we want to accomplish. Very much so! I think it's a natural thing for more possibilities to open up as your career evolves. And your mission should likewise adapt to that. Susan I love to read your posts- you are so wise! All-important thoughts recorded in a concise way. Thanks for the reminder. Great addition to this series of posts. I think it's important to know what your core mission is about in order to sift through the shiny new ideas our brains come up with. How we choose what to write next. Of course, we want to love it and I realize we can go a little bit out of our brand, but this mission statement will help. Exactly! It's a tool to help you know what you're about, and to guide you when the tough choices come up. I understand more today, than I did before, why I write. And that keeps me pushing and plotting my future stories in a bit of a more calculated manner. I think there are too many people impatient to get published. It really is a process. I like the idea of your mission statement staying pretty constant–our core values don't change. But our writing experience does. I'm in this 7 years. With each novel I get better. Wow, a million words. So impressive! Thank you for this. I'm bookmarking it and going back to reread it this evening when I'm not rushing around. I like the notion of a mission statement (and one regularly updated) which, for me, would gather my thoughts and crystallize some things I've been considering.